After three decades of restoration and renovation, this university town’s comeback is complete. Here’s how to enjoy it. 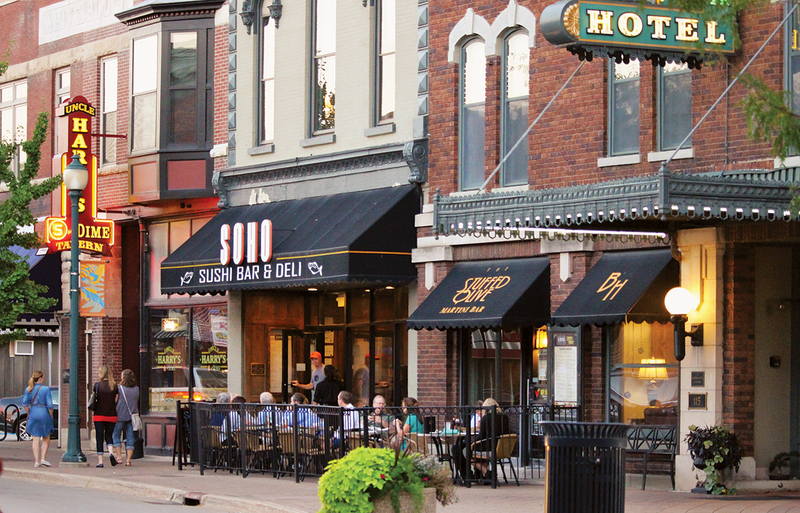 Above: Popular bars and restaurants line Main Street in downtown Cedar Falls. Until recent years, the only experience I’d had with Cedar Falls was when the Rolling Stones made a stop at the UNI-Dome late into their 1981 tour. Dressed in a flashy oversized sweater and candy-colored leggings, I made a lightning trip from one college town, Iowa City, to another. After the concert, my fellow travelers and I crashed on the floor of a friend of a friend of a friend. The next day, we headed back early enough for our driver to clock in for a morning work shift. 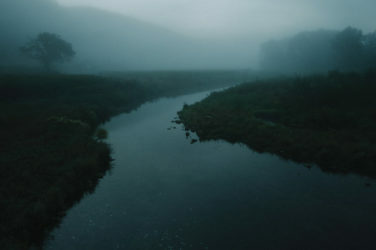 Had we lingered, there might not have been that much to see. Following retail’s rush to the malls in the 1960s and ’70s, many of the shops in the city’s historic downtown had closed or decamped. According to Kim Manning, manager of the Cedar Falls Tourism and Visitors Bureau, by the mid-’80s, the wrecking ball loomed: Proposals to raze swaths of Main Street’s desolate and disused Victorian and early-20th-century buildings were afoot. What a difference three decades make. In 1987, a Community Main Street program stepped in to save the city’s core. 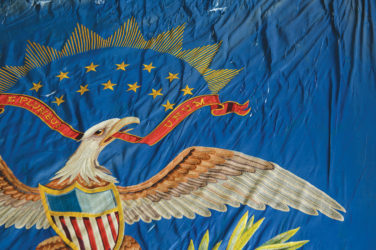 A significant step along the way was the restoration of the former Cotton Theatre. In 1994, the 1910 Italian Renaissance-style building was restored and renamed the Oster Regent Theatre. It now houses the Cedar Falls Community Theatre. “Once the theater was restored, a coffee shop opened, then a restaurant, then another,” Manning says. In the early 2000s, the down-and-out Blackhawk Hotel was completely restored, with modern comforts and vintage splendor, by new owners Dan and Kathy Tindall. Dan Tindall died in 2017, and the hotel is now owned by Mark Kittrell, a developer who recently upped downtown’s ante with River Place, a new residential-commercial project a block from Main Street. After 30 years of partnerships between various community organizations, Main Street’s comeback is complete, and today, downtown Cedar Falls buzzes with 30-some bars and restaurants, dozens of boutiques, plus entertainment venues, a gaming arcade, tattoo shops and day spas. But don’t worry, it’s not too cute: A few dive bars, a thrift shop and an offbeat, packed-to-the-gills model train shop keep downtown a little funky. Even more impressive—and of interest to the active weekend traveler—is how the lively city’s core seamlessly connects to outdoor recreational opportunities, including over 100 miles of hard-surface trails. Once you get downtown, you can enjoy an entirely car-less weekend escape. In the past few years, I’ve visited Cedar Falls on four occasions, with stays ranging from one night to three. 36-hour itinerary for a great weekend getaway. Stay downtown. That way, you can park your car once and forget about it until Sunday. 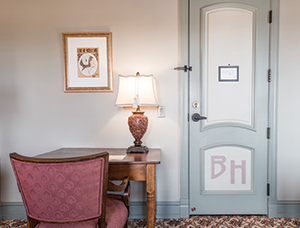 Fans of historic hostelries must snag a room at the Blackhawk Hotel. Built in the late 1870s and redesigned in 1914, the building combines Second Empire and Mission-style architecture—to me, it feels more Old West than Old World. Each room is different, but the ones I’ve stayed in (or stolen a peek at) meld mod cons with unfussy period style, flaunting such details as stamped tin ceilings, heavy wood furniture atop floral-patterned carpeting, and long, narrow windows, some of which look out onto Main Street. Expect armoires instead of closets; on a recent stay, ours even had an atmospherically creaky door. 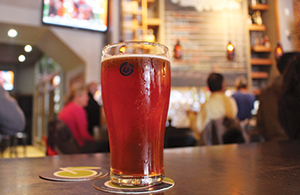 After settling into your digs, snag a craft beer at one of the breweries on or near Main Street. Both SingleSpeed Brewing Co. and Second State Brewing Co. offer pleasant patios where you can shrug off your workweek and start to soak in the amiable vibe of this historic-yet-vibrant downtown. I’ve found no highbrow gastronomy in Cedar Falls. However, what I found at Whiskey Road Tavern and Grill was something that’s often even harder to chase down: truly gratifying, thoughtfully prepared casual American food. 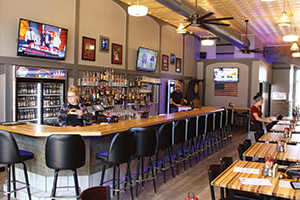 The downtown hot spot serves a crowd-pleasing array of burgers, sandwiches, steaks and down-home specialties such as fried chicken and ribs. Better yet, they do so with care: The steaks are hand-cut, the shrimp hand-breaded, and much else on the seven-page dinner menu is homemade, from the tortilla chips to the pretzel bread. I especially recommend the prime rib, served Thursday through Saturday nights. Whiskey lovers will revel in the 11-page menu offering more than 100 options from America and overseas. Beer lovers need not feel slighted: The 10-plus taps offer craft selections, and always include a barrel-aged option. The Blackhawk Hotel offers a simple breakfast buffet. However, if you’re jonesin’ for some serious coffee or something more substantial to eat, head to Cottonwood Canyon. Located in a cozy house a block off Main Street, this coffeehouse serves espresso drinks as well as breakfast burritos and sandwiches. P.S. : If a picnic is in your lunch plans, consider scoring a wrap or sandwich to go. Bring your bike, snowshoes or cross-country skis—or rent them at area outfitters, including Bike Tech (for bike rentals) and Europe Cycle and Ski (for snowshoes and skis). The looped system within the Cedar Valley Trails Network allows you to start and finish a trek downtown without having to retrace your path. 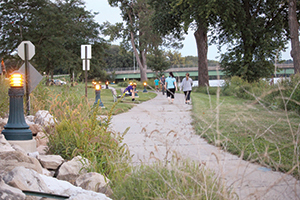 Many of these paved, multi-use recreational trails skirt or traverse the Cedar River, including the popular Cedar Valley Lakes Trail, part of which winds through George Wyth State Park. This 1,200-acre park encompasses four lakes, vast woodlands, plenty of picnic spots and six miles of soft-surface trails. For an easy yet rewarding walking trek that will get you back in town for lunch, drive to the parking lot of Big Woods Lake and hike the two-mile trail that rings the lake and also takes you through woodlands and a restored prairie. Outdoorsy types will probably want to stick to the trails for much of the day. If you’re biking the entire 17 miles of the Cedar River Loop, stop for tacos, sliders and other casual fare at the beer garden of the Waterloo outpost of the SingleSpeed Brewing Co. Just a few blocks from the South Riverside Trail section of the loop, the brewery is housed in a renovated historic Wonder Bread factory. If you’re heading back to downtown Cedar Falls for the afternoon, eat heartily at Wilbo Burgers and Brats, a relative newcomer to Main Street. The well-crafted burgers can be topped with a variety of goodies such as smoked Gouda, crispy mac and cheese and beer cheese sauce. 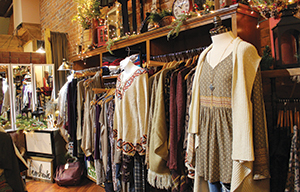 Independent boutiques line both sides of Main Street. It’s worth spending a leisurely afternoon poking in and out of the great variety of shops, offering everything from bridal wear to sportswear, with plenty of jewelry, handbags, dressy fashions, housewares and home decor in between. 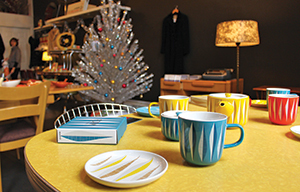 Anyone who can remember the 1950s, ’60s and ’70s must pop into Miss Wonderful. Filled with well-curated and beautifully displayed collectibles, the cheerful vintage shop will feel like a museum of your early life. If modern prairie style is more your beat, check out Little Prairie Girl for rustic home decor and boho-chic clothing. 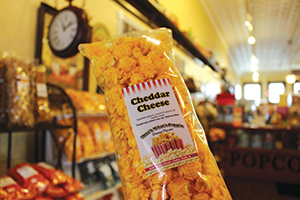 When it’s time for a snack, snag some gelato at Chocolaterie Stam, a cupcake at Scratch Cupcakery or some caramel corn at Here’s What’s Poppin’. Hikers and bikers can gratify their weary muscles with a treatment at a downtown day spa. Jiva Salon Spa and Kate & Co. Salon and Spa both offer a range of massages, as well as other spa and beauty services, including facials, waxing and hair and nail care. Toward the end of the afternoon, stop for a thoroughly civilized tea break at the Tea Cellar and its more than 50 loose-leaf teas. 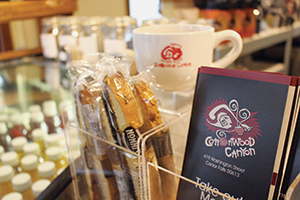 Take some home, but also be sure to enjoy a cup—alongside a locally baked sweet, if you wish—in the soothing and modern limestone-walled room. After tea, take a gander through Basket of Daisies, the elegant home-furnishings store upstairs. Slide onto a seat at Figaro Figaro’s handsome blue-lit bar for a craft cocktail and some bar bites, and you might just hear someone spontaneously break into song. The restaurant is owned by actor, performer and former “Saturday Night Live” cast member Gary Kroeger, who sources many of his talented server-singers from nearby University of Northern Iowa. Head to Montage, a multilevel restaurant with an impressive wine list housed in an old brick building. Choose a booth in the stylish bar area or a white-clothed table in the more staid dining room. Or, settle into the upstairs lounge, with both soft seating and high-top tables. Whichever spot you select, you can enjoy a solid menu of flatbreads, pasta, steaks and a good mix of chicken and fish options. Most menu descriptions include buzzwords often found at contemporary venues. For example, Hoisin sauce glazes bacon-wrapped scallops; prosciutto and arugula top a chicken flatbread; and chipotle sauce livens up the crabcakes. On a recent visit, we enjoyed a piñon-crusted chicken breast and a simple but well-wrought margherita flatbread. 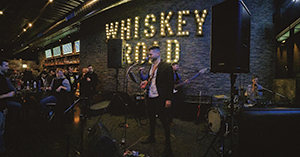 Venues on or near Main Street that offer live music most weekends include Cup of Joe, a popular Main Street coffeehouse; the Brass Tap, a casual corner bar and grill with over 300 craft beers; and Figaro Figaro, which has live jazz in an upstairs lounge. 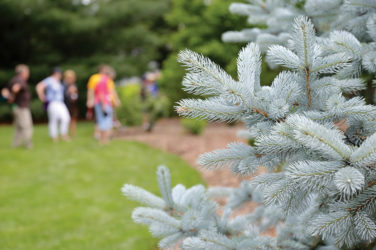 If you’re willing to go farther afield, check out the live music page at cedarfallstourism.org for a monthly schedule of musical events that includes what’s happening on the Hill (the business district near UNI’s campus) and in nearby Waterloo. Sleep in and soak up as much of the Blackhawk’s easygoing charms as long as you can—your manic modern Monday will come soon enough. After breakfast at the hotel, enjoy a quiet Sunday morning walk by the river. Before you head out of town, swing by Cup of Joe for the caffeine you need to get you back home.